HIKING THE NARROWS!!! Everyone Has to Do this One!!! Maybe you can tell by the generous use of exclamation points and ALL CAPS in the title, I loved every minute of hiking the Narrows. I can’t say it enough, this is one of the coolest, most beautiful, jaw-dropping adventures I have ever experienced. I am not sure how to really do justice to a hike where you are trekking 98% of the time up a river, in a canyon only 20-30 feet across in places, and all the while surrounded by blazing red and black, vertical rock walls 1000 feet and higher. I hope I can capture the magnificence of this canyon, and the hiking experience, because I can’t urge you enough to make sure you add this adventure to your Life Bus list – if you haven’t already. Todd, my 16 year old nephew, and I all set out for a Memorial Day weekend adventure to Zion National Park last spring. I was so excited I couldn’t stand it. The Narrows has been on my life list of must-do adventures forever. We hiked the Narrows on the second day the hike had been open. The water flows were very high, so high that they almost didn’t open the hike. I will say at this water level, I would think twice about taking little ones, or anyone else with balance or strength issues on this trek. We are mountain bikers, hikers, and runners with pretty strong legs and we still had to really muscle our way through sometimes. The water flows were very powerful. Even though if you were to slip and fall you wouldn’t shoot off of into the oblivion, you could definitely find yourself being taken by the current for a bit in very chilly water. We got to Zion Outfitter at 8 AM on the Saturday of Memorial Day weekend. I would highly recommend renting the special neoprene canyoneering socks and booties, as well as the big, wooden hiking stick. I originally poo-pooed the idea of renting the stick because we have awesome trekking poles. I am so thankful that we rented the sticks. I don’t think it would’ve been doable with trekking poles. The water flow was so powerful that our sticks would’ve most certainly been snapped into bits The wooden trekking poles are so sturdy when you jab them into the rocks and, they give you a great, stable point from which to push off when moving upstream against the flow. The water was quite chilly when we were there as it was spring snow melt. I was borderline on renting a wet suit but I’m glad we didn’t. The weather outside was perfect and nicely warm so the water, once you got used to it, was actually quite refreshing. I would say if it is not a really sunny, warm day, I would recommend more clothing options because the canyon walls definitely make the temperature in the canyon considerably cooler. Hypothermia could easily become an issue at this early time of year with a combination of cold water and cloudy, cool air temperatures – just something of which to be mindful. I would also recommend having some kind of lanyard and clear pouch for your camera. You are definitely going to want to take pics!!! Really, you need to put everything in your daypack into some kind of water proof pouch in case you fall into the water or just get your stuff splashed on. We stopped at the awesome one-stop pitstop in Springdale, Hoodoo’s Market, for some picnic provisions – including delicious sandwiches, bakery treats, and chips. Then we were off and running – or so we thought. The one downer moment of this experience is indeed the CROWDS. Good news is that once you go at least a mile up river, you wind up losing most of the crowds. Just be mindful that you can not drive into the park. Everyone has to line up at a shuttle stop to get on the shuttle that takes you throughout the park and to the Narrows trailhead. The shuttle stop looked like we might have taken a wrong turn somewhere and arrived in Disneyland instead. There were hundreds of people lined up to get on the shuttles. The GOOD NEWS is that the shuttle moved very quickly and we were then really on our way. The hike up the Virgin River starts at the Temple of Sinawava shuttle stop. You start on a paved trail which goes for about a mile The pathway ends on a small beach area where you gain access to the river. The first portion of the hike up the Virgin River has quite a few people as well. Don’t fret, as I mentioned earlier, keep on keeping on and you will leave the crowds behind. The water gets higher and more dramatic the farther you go, at least at the time of year we went. One tip I would recommend, purchase your gear and provisions the day before if at all possible. This way you can go directly to the shuttle station in the National Park and get on the shuttles about an hour earlier than it takes to get your gear and food and then go to the shuttle stop. Did I mention that my 16 year old nephew is 6’8″ and weighs 220 lbs? He came in quite handy as we navigated our way upstream. There were several places where we couldn’t quite tell how deep the water was. We used my nephew as the human dip-stick and sent him ahead. If the water came up to his shoulders or lower I figured I could go that route. There were a few times where the water was up to his nose. One time I forgot what I was doing and followed him. I found myself immediately submerged in some very chilly water. (I’m 5’10” for reference.) After a moment where it took my breath away, the water actually became rather enjoyable. I would, however, gauge your own level of enjoying chilly water and please always remember that hypothermia could easily become a problem here. We continued on and enjoyed a picnic lunch along the way on some boulders on a nice sandy beach. We wanted to make it to the Big Springs turnaround point which is about 5 miles upstream. I would say you should at least shoot for the Wall Street portion at the very least. This is where the walls of the canyon become the narrowest. We made it about 4 to 4.5 miles but a couple of factors lead to a delayed start and a longer day on the river than expected: purchasing gear and provisions took longer, the shuttle stop took much longer than anticipated, working our way up 4 miles against powerful water, and taking photos and picnicking made our upstream trek take longer then we had planned. We turned around just to be sure we would make it back before it got late / dark. Even as the light begins to go down it gets much cooler in the canyon. My clothes were damp and I started to get chilled towards the end of our day. In all we hiked about 8-9 miles which took us around 6 hours to do. We are endurance athletes but, given the water flow, it was definitely slow going. We also stopped for lunch and photos so keep that in mind when estimating your time. To finish off the perfect day, we had an amazing meal at the Whiptail Grill in Springdale. To say we were hungry is a true understatement. The three of us inhaled some delicious tacos, burritos, and some of the best ribs I’ve ever had. I hope I’ve intrigued you about this hike. It is one you will never forget or regret!! Remember to use the loo before if at all possible. There are no port-a-potties at all on this trek. Remember to keep everything in waterproof pouches. We used our regular day bags and just put the waterproof bagged items inside the daypack. Highly recommend renting the neoprene socks, booties, and wooden walking stick. The wet or dry suits are up to your own preference as well as water / air temperature. We hiked from the bottom up route. No special permits are required for hiking in this direction. Hiking beyond Big Springs is prohibited when hiking in this direction. You can hike top down but this direction requires a permit. Check out the ZNP website for specifics on that hike. I would seriously heed any recommendations about flash flood warnings when considering this hike. Get to the park entrance / shuttle stop ASAP in the morning to avoid as much of the potential for crowds / delays as possible. Savor every moment of this beach-taking trek! Please feel free to reach out if you have any questions at all about this adventure. One of the best things about living in sunny southern California is that while the rest of the country is still trying to thaw out from winter’s freezing temperatures and snow, those of us here in SoCal can venture out for a day of sun, fun, and adventure along the beautiful California coast. Recently, the Jac-walds (Jeff, Cinda, John and Melissa) decided to beach cruise the north county coast highway of the 101 in San Diego. So Cal is a mecca for micro breweries, seaside cafes, beachside bars, fun people watching, and plenty of sunshine. If you don’t have a beach cruiser, there are plenty of places in San Diego to rent a bike for the day. Depending on how long and where you want to ride, you can pick the right place to rent your cruiser. Carlsbad to Solana Beach: that is the path we took and a glimpse of that path and activities are shown below. We recommend parking in Carlsbad and heading south on the 101. Mission Bay is a great area to beach cruise. It is 10 minutes north of downtown off of I-5 and Mission Bay drive. Beach cruising is easy with 27 miles of paved paths. If you are looking for other things to do you can kayak on the bay, go sailing, paddle boarding, jet skiing, kite surfing, and there are even bonfires at night (which is not allowed on most beaches in San Diego). Pacific Beach (3 mile oceanfront boardwalk). Great people watching, beach volleyball, surf shops, restaurants and nightclubs. The boardwalk gets crowded in the summer and on the weekends so make sure to be patient and watch for those that are skateboarding, rollerblading (yes, people still do that) and strolling down the boardwalk. Ocean Beach (lots of areas to cruise around the boardwalk and also along Newport Avenue). They have fun antique shops, vintage stores and artist studios that are mixed in with restaurants. Coronado Beach is a locals’ favorite with a true beach town vibe. There is not a huge oceanfront cruising area, but if you start out near The Hotel Del Coronado, you can get some biking done oceanside. It is fun to venture into the downtown Coronado area or into the beautiful neighborhoods. Union Kitchen and Tap in Encinitas. With it’s roll up doors, extensive drink menu, and great food you can’t go wrong. Cedros Avenue (http://www.cedrosavenue.com) is a 2 1/2 block long street with over 85 boutique shops, furniture stores, and a great music venue called the Belly Up. Pizza Port Tasty Grub and Grog in Solana Beach. The best Pizza that I have found in my 12 years in California. Pizza Port is ALWAYS busy so be prepared to wait…but know that it is well worth it! These cookies are moist, flavorful treats in traditional and unique flavors. The cookies are named after 1940’s girls’ names reminiscent of those images painted on the sides of fighter planes. Penelope is the best peanut butter and chocolate cookie you will ever try, Vivianna is mango and chocolate, Margo is a chocolate cinnamon cookie with a molten milk chocolate center, and Judy has velvety orange cookie dough topped with cream cheese frosting. You know that five second rule with food? For these cookies I would extend it to the five minute rule. If you can’t get yourself to SLC to enjoy these freshly baked treats, don’t panic. The good news is that Ruby Snap does have a website where you can order frozen cookie dough in numerous flavors. When riding around on The Life Bus, you always need to have some good sweet snacks close by. Tasty Road Trip Burgers and Sandwiches at Grind in Glenwood Springs, CO!! So, we established that I like food, right. I’m always on the look out for the interesting, non-chain dining experience whenever we are out and about. It is this obsession that led Todd and me to Grind in Glenwood Springs, CO. Grind has to be the best sandwich shop in Glenwood Springs. It’s a funky, little hole-in-the-wall place right in the heart of downtown Glenwood Springs. The place is neat and clean with the friendliest staff. They have figured out how to make some great sandwiches. They source all of their meats locally and grind it themselves. Todd rarely gets super excited about food but he definitely made some grunting noises that sounded like contentment while he inhaled his SXSW burger … buffalo, pepperjack cheese, pico de gallo, avocado, jalapenos, chipotle mayonnaise, and lettuce. I was having a similar experience as I inhaled my own treat, the Sultan … house made falafel, tzatziki, marinated tomatoes, sprouts, and lettuce. Everything about these tasty morsels was top quality, simple, and fresh. The onion rings and shake were no exceptions. I was extremely happy with this find and will be making a pit stop here whenever the Life Bus cruises through Glenwood Springs. Truth be told, as I’m writing this I am wishing I were in Glenwood Springs eating at Grind right now!! Enjoy!! On our layover in Juneau between our East Turner Lake adventure and flying to Gustavus, we had exactly one hour before our plane left. There was never any question between the four of us how we would spend that hour. We literally ran from the airport gate to the taxi cab stand, flagged down a cab, and said “take us to Tracy’s Crab Shack.” The cab driver raced through the outskirts of town to Juneau and careened up to the Shack. We ran up and ordered 4 buckets of claws and Alaskan ambers. (I’m drooling just writing this.) Inhaling would be a good adjective to describe how we woofed down the moistest, most flavorful, meatiest crab legs you can imagine. Tracy’s is a supporter of Alaska’s sustainable fisheries as well. We had our first taste of the divineness that is Tracy’s while we were in Juneau the night before heading out to East Turner Lake. The guide book had indicated good crab located by the cruise ships. Both were understatements.The crab is amazing and the Shack is basically right up against the cruise ships right by the gang planks passengers use to load and unload from the ships. It’s tiny size is dwarfed by the hulking ships a few feet away. Tracy’s is one of those tiny shacks that make you wonder how they can produce the quantity and quality of the food they do. Topping off the great seafood we had Alaskan ambers. This was one of those moments you have to ask, does life get any better than this. We jumped back in the waiting taxi and made it to the airport just as they were loading up the plane. I think Greg is still in amazement at the fact that we spent $100 to get crab legs. Hope that gives you an idea of how good this hole-in-the-wall is. To me, Tracy’s represents one of those places and times in a trip you just want to last forever. Good food, good friends, great memories! The spontaneous nature of this outing to Tracy’s is pure Life Bus living! After a spectacular seven days sea-kayaking the Sea of Cortez (more on that in another post), Todd and I decided to see all that the southern most portion of Baja Mexico had to offer. That’s how we found ourselves bouncing down the Carretera Transpeninsular headed from La Paz to Todos Santos in a tiny, rented tin can. From what I understand, the highway has since been widened to 4 lanes. The fact that there are no shoulders and that detours and / or road damage can occur with almost no warning apparently hasn’t changed. Although Todos Santos is tiny, it’s one of those artist and surfer communities that is coming into its own where you can find galleries and eateries in neat old buildings. Given the fact that Todd is really not much of a shopper, I don’t have much commentary on the galleries. We did have some fun food pit stops here, however. The food find that really stands out as a Life Bus moment is Restaurante Miguel’s. 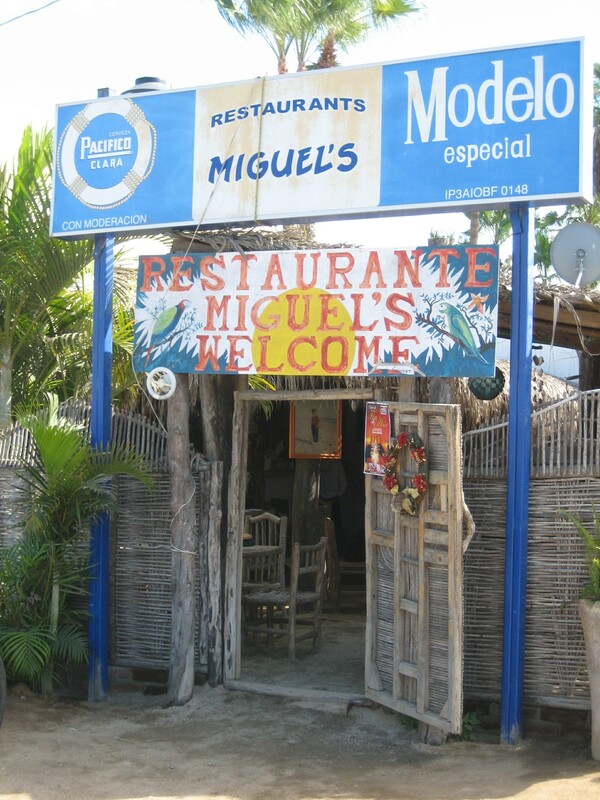 If I could have designed my perfect rustic, Mexican, beach restaurant, Miguel’s would be it. Thatched palm roof, dirt floor, no real walls … just thatched half walls and great chile rellenos … and beer! A relaxing, Jimmy Buffetesque kind of place where you can kick back, enjoy a good meal, and soak in your Mexican vacation. So, when exploring the Baja Peninsula, make time for a pit stop in this artisan community. I think you’ll enjoy it! To understand just how good the pie is at the Otis Cafe and why it merits its own pilgrimage to Otis, you have to know that you are going to Otis exclusively for the cafe. Otis is basically an unincorporated community in Lincoln County, OR. It is one of those places so small that it has been put up for auction with a starting bid of $3 million dollars. Included in this fire-sale were such items as: the gas station, mini grocery store, Pronto-pup corn dog stand, two houses, the Otis post office, the Otis Cafe, an auto-repair garage and … well you get the idea … a very small place. Have I mentioned before that I love food … very high on that list of favorite foods is strawberry-rhubarb pie. In fact, Todd and I make it a goal to try to find some form of this tasty treat on every trip we take. So when we heard about the Otis Cafe and its pies there was no doubt that we would have to make our way to Otis. The gods were smiling on us that day. To date, this is still the best strawberry rhubarb pie we have ever experienced. The cafe is a quintessential, quaint roadside diner that epitomizes a road trip pit stop. There wasn’t anything we had that wasn’t amazing. And if strawberry rhubarb isn’t quite as much your thing as it ours, never fear, there are numerous other pie options to delight your tastebuds. 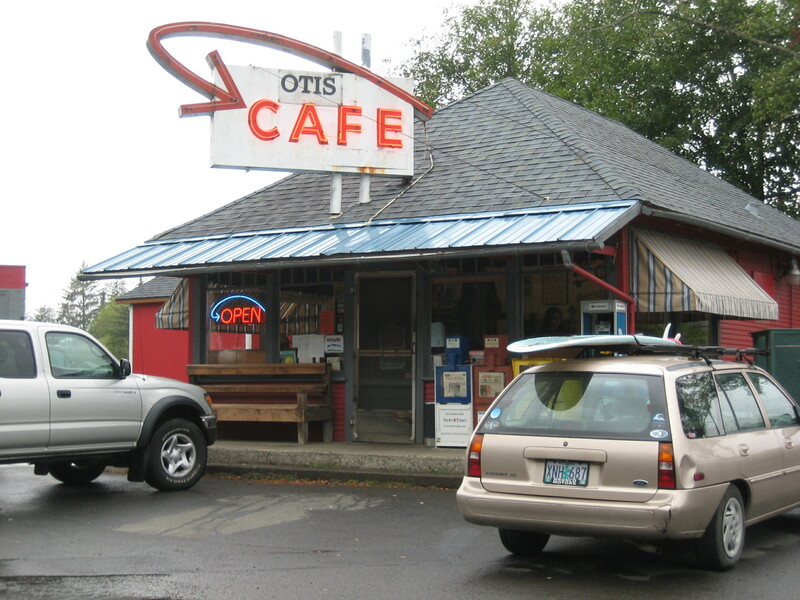 So please, if you’re driving along the Oregon Coast, do yourself a favor and veer off the road to the Otis Cafe. Enjoy!! And, as always, if you try Otis Cafe out, let me know your thoughts. I am a firm believer in supporting local businesses and I don’t mean the Home Depot or the Starbucks down the street….absolutely love to do it…..makes me feel as though I am part of a community and that I am taking care of those who make my small town interesting and fun. One of my favorite things to do in Golden, CO, is to visit the Farmer’s Market on Saturday mornings. I bought a bike 2 years ago for the sole purpose of riding to and from the market – have I ridden said bike even once? Nope – I need to get off my rear-end and make it happen. Admittedly, back in the day (8 or 9 years ago), I remember thinking how sad the Golden Farmer’s Market (GFM) was….a few booths with the standard fruits and veggies and Mary Kay Cosmetics. No offense to MK, thanks to this multi-billion dollar company, pink Cadillacs can be seen all over America’s roadways – where would we be without them? Over the years, the city of Golden has been able to attract some pretty cool vendors who are bringing excellent product and more appealing store fronts. You can find an interesting variety of fresh pastas from Tony at Pappardelle’s, organically grown fruits and vegetables from a variety of local farmers, soft serve ice cream (breakfast of champions on a Saturday morning), and locally roasted coffees from the Table Mountain Roasters, just to name a few. Don’t expect to find dream catchers, American Indian prints in black velvet, or cheap arts and crafts – if this is what you are looking for, the GFM is not the place for you. The crowds here are manageable and family friendly – feel free to bring your pooches and kiddos along. After an hour or so of picking the perfect bag of fruit, sampling unusual foods, and suffering from brain freeze from your ice cream cone, you can take a stroll along Clear Creek. If you want to get really ballsy, rent an inner tube and float down the river. When to go? Every Saturday 8 am to 1 pm from the first weekend in June until the first weekend in October. Jump on the Life Bus – do something new and crazy and make the 17 mile drive to Golden (from Downtown Denver)! In true Life Bus fashion, Pam. Greg, Todd, and I were continuing our Alaskan adventure by driving to Denali National Park to try our hand at backpacking in Denali’s backcountry. On the highway to Denali we saw signs for Talkeetna and veered off the road to make a pit stop here. All we had really heard about Talkeetna was that Talkeetna was a tiny, scenic mountain town and the place where most climbers begin their quest to summit Denali. Despite the fact that our views of Denali and the surrounding mountains were obscured by low clouds and mist, Talkeetna is a pit stop any Life Busser has to make when venturing in Alaska. With or without the spectacular views of the Alaska Range, Talkeetna is a town with a great vibe, great food, and great people. Even if you are not part of the mountaineers heading out to take on Denali, you can’t help but feel a part of something cool when you are here. You almost feel like you want to grab some crampons and go for it. Normally I would never speak kindly of dampness but in Talkeetna it makes you want to grab a cozy fleece and head in doors for a cup o’ coffee and one of the world’s best cinnamon rolls. Talkeetna might be the epitome of a Life Bus pit stop. In Talkeetna you will see people getting ready to push their limits on Denali, people who have chosen a slower life way off the grid, and people like us who love these small, out-of-the-way towns with character and scenery in abundance. This scenic, historic, “end-of-the-road” town feels like you just stepped onto the set of Northern Exposure. This is a town where, we were informed by the locals, they have a sign-up list for moose road kill. When a moose is killed on the roads, the carcass gets shared with whomever is on the list. Talk about using all of your resources to the fullest! Quaint, historic store fronts line the town’s tiny main thoroughfare with lush, beautiful flowers that appear to thrive in this damp climate. For such a tiny town, there are quite a few great looking watering holes. We ventured into the Roadhouse for a bite to eat. Wow, what a find!! Talkeetna Roadhouse. The Roadhouse is the quintessential, mountain-town, breakfast joint jam packed with patrons hanging out in various levels of fleece / climber fashion. The walls are adorned with tons of Denali climbing memorabilia. It is a small, busy place and you wonder how they turn out such amazing food in a building built in 1917. Anyhoo, let’s get to the really important part of all of this …. the food. We saw pancakes the size of platters draping over the edges of the plates, burritos the size of your head, and yes …. gooey, not too sweet, humongous cinnamon rolls that are gifts from heaven and still have me dreaming about them. So good I recently tried to FedEx them to Colorado for my husband’s birthday. No dice, they said they won’t travel well. We then cruised over to the West Rib Pub. We had good hamburgers and a great local bartender. In all honesty, there isn’t a ton to do in Talkeetna proper. It is clearly an access point to lots of outdoor adventure. It is, however, very beautiful, has great food, and a cool vibe which makes it worth a stop. And, if you’re lucky to have good weather, the views of the Denali and the Alaska Range are said to be breath-taking. One caveat, we had the misfortune of sharing this quaint town with a tour bus full of cruisers from a Princess Cruise tour. They apparently descend on the town periodically. Oh well, what do you do? So, take your bus to Talkeetna sometime. The beauty and cinnamon rolls are worth the trip!! !